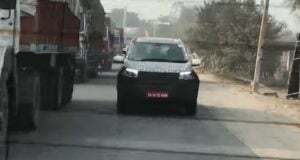 Regulars here would remember our report on the first-ever sighting of the upcoming Mahindra XUV500. Today, we have a new video of the updated XUV. The latest video reveals that the new model will come with an updated set of headlamps, which will feature new LED DRLs. Also, it looks like there will be a new radiator grille and a new bumper at the front. 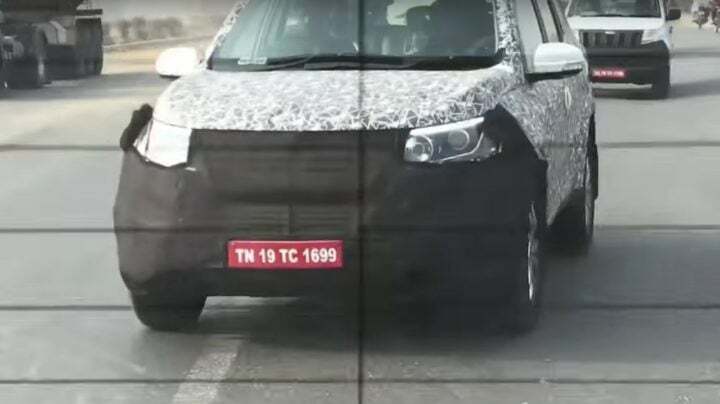 The new Mahindra XUV500 facelift will most likely launch in the first-half of next year. An Auto Expo 2018 debut looks highly likely. Specifications are expected to see huge improvements owing to the introduction of a more powerful engine. While the test mules in the pics we have seen so far are wearing a rather heavy camouflage, it is pretty evident that the model won’t get any sort of a substantial change to the sheet metal. So far, the only changes we have been able to make out is the new set of stylish multi-spoke alloy wheels and updated headlamps with new DRLs. Also, the camouflage hints at a revised front facade. 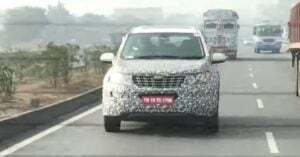 Akin to the about-to-launch Mahindra Scorpio facelift, the 2018 XUV500 will get only some minor updates to the exterior design. However, the biggest change will come in the form of an updated motor. So, basically, the Scorpio is about to get the current XUV500’s 140 bhp engine, and the XUV500 facelift will get an even more powerful engine. The new 2.2-litre motor is likely to output 170 bhp and 400 Nm. This will ensure that the XUV remains the most powerful SUV in the company’s line up. Even the upcoming XUV 500 facelift will be available in 2WD and 4WD layouts. Both manual and automatic transmission options will be available. Mahindra and Mahindra is yet to let out any sort of official information on the launch of the XUV 500 2018. That said, we won’t be too surprised to find out this SUV on display at the Auto Expo 2018. It may be noted here that the facelift doesn’t look too different from the current model. Hence, Mahindra should be done with the development of the new model in coming months. We expect the New Mahindra XUV500 facelift to launch by May 2018. Stay tuned to Carblogindia for the latest news on new Mahindra XUV500 facelift.